THE MORE YOU ORDER, THE LOWER THE PRICE! Prices range from $.85 to .65 each. THE MORE YOU ORDER, THE LOWER THE PRICE! Prices range from $0.79 to .59 each. 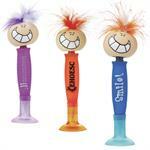 Goofy Pen is part bobble-head and part pen and all smiles. Prices range from $1.99 to $1.59 each. 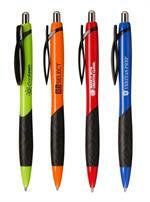 Our Swanky Awareness Pen makes it easy to have a custom colored awareness ribbon on a playful pen. Prices range from $1.49 to .85 each. 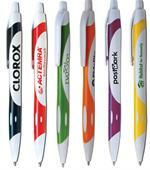 Our Awareness Ribbon Pen has a molded plastic ribbon clip and a comfortable rubber grip. Prices range from .69 to .52 each. 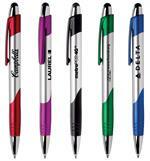 For the first time, the Papermate Write Bros. 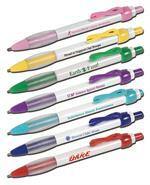 Stick Pen is available with custom imprint. 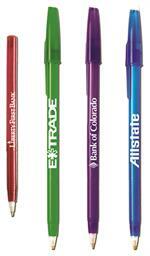 This classic pen is now available in a wide variety of colors and is the same quality pen we all remember from school. Prices range from .49 to .30. Stock Pencil: "No Excuse For Abuse" and "You Are Not Alone"
Our Stock Pencils are available in Blue with the saying "No Excuse For Abuse" or Teal with "You Are Not Alone". Prices range from .69 to .24 each depending on quantity ordered. 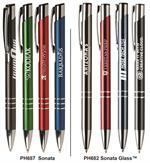 Classically designed, the solid Knight pen is a solid twist action ball point pen with 24 karat gold plated accents and the highest quality, jumbo metal cartridge. 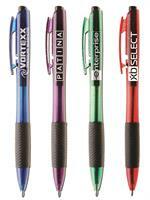 The price for the Knight pen ranges from $4.49 to $3.79 each. Order as few as 50! Classically designed, the marbled Knight pen is a solid twist action ball point pen with 24 karat gold plated accents and the highest quality, jumbo metal cartridge. 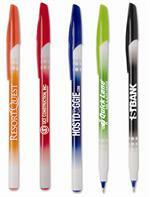 The price for the Knight pen ranges from $5.99 to $4.19 each. Order as few as 50! 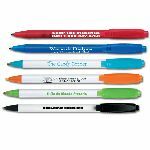 Great for promotional events, the inexpensive yet sleek and versatile MaxGlide Stick® Pen features a coordinating barrel and cap. 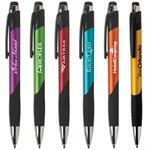 It contains patented MaxGlide® hybrid ink. Prices range from .35 to .25 each. 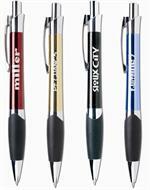 A great give-away pen! 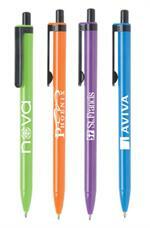 The translucent stick pen barrel is offered in four stylish colors. 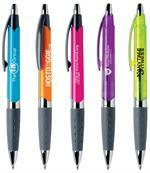 Prices range from .25 to .19 each. Sparkling, translucent hourglass barrel and trim. 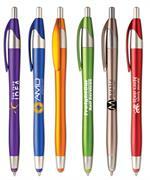 Our Tryit™ pens have a ribbed grip for writing comfort and a unique clip activated retraction. Prices range from .29 to .21 each. 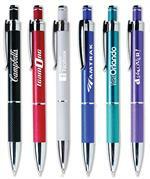 Our Bellboy™ pen has a vibrant, brightly colored barrel with sculpted ribbon style clip and an ergonomic, diamond textured rubber grip. Prices range from .49 to .32 each. 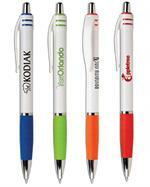 The Torano™ pen features a vividly colored barrel with a generous imprint area. The price ranges from .59 to .39 each.